As well as working for the National Literacy Trust, I also perform comedy improvisation. For those that don’t know, improvisation is a form of unscripted theatre created on the spot. I have performed improvised comedy shows across the world from New York to Amsterdam, at unusual venues like the National Gallery and the Natural History Museum, and at unique events such as the COP21 Climate Conference fringe in Paris. But, until last week, I’d never performed comedy improvisation in a library. A library isn’t an obvious place for a comedy show – it can be easy to see libraries as being places of quiet rather than laughter. ‘The Library Presents’, an Arts Council funded project delivered by Babylon Arts and Cambridgeshire County Council, is looking to change how we view our libraries by programming a range of activities in Cambridgeshire libraries, including puppetry performances, singing workshops and watercolour painting - and improvised comedy! Which is why over two nights in February, my improvisation group, Do Not Adjust Your Stage, found ourselves in the towns of Ramsey and Wisbech performing comedy inspired by the books around us. Our show, entitled the Improvised Book Club, was simple: audience members would choose books from the shelves, we would chat to them about their choice and read a couple of sentences from the book, and then we would use this to inspire improvised comedy scenes and sketches. 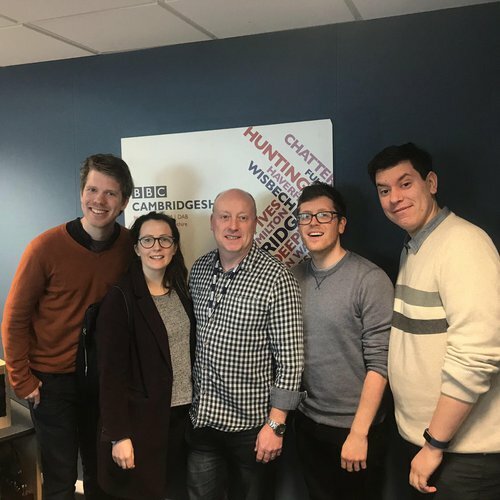 Prior to our shows, we had the opportunity to speak about our event live on BBC Radio Cambridgeshire. When we got to each venue, it wasn’t too difficult with some curtains and basic tech to transform the library into an intimate performance space. Most importantly, our performances went well. The audiences’ choice of books was diverse, from ghost stories to Young Adult fiction, and from crime thrillers to a self-hypnosis instruction manual, giving us ample material to create comedy sketches. It also meant that our show managed to entertain an audience whilst showcasing the sheer range of books available from each library and hopefully encourage our audience to continue (or begin) using the library. So, what did I learn? Well, first off, I learnt a lot to help me with the events I’ll be organising in libraries for the National Literacy Trust this summer. As part of the National Literacy Trust’s Young Readers Programme and thanks to funding from WHSmith, children will be visiting libraries in Swansea, Manchester and Peterborough to watch storytelling performances and participate in author workshops as well as getting to choose a brand new book of their own to take home. Additionally, The Library Presents was a welcome reminder of the benefits of looking beyond our traditional understanding of what a library can offer. For me, libraries are so much more than just their books – they are shared spaces which can bring the whole of a local community together. And, it turns out, they are also the ideal space for a comedy improv show! Another great space for comedy improvisation is the classroom! Improv is a great tool to use with pupils to develop speaking and listening skills as well as confidence and teamwork. If you’re a teacher and this has inspired you to run some improvisation activities in your school, you can check out Nick’s improvised comedy resource for KS2 teachers which includes lots of fun games to get your pupils improvising. Nick’s improvised comedy troupe, Do Not Adjust Your Stage, has one final ‘Improvised Book Club’ performance in March. See The Library Presents website for more details. To see more of the National Literacy Trust’s work with libraries, take a look at our Love Our Libraries project.